There’s something startling about the Skoda Kodiaq, or rather, the space it fills. 20-lakh-rupee sedans had their death warrants signed by SUVs like the Toyota Fortuner and Ford Endeavour. Capable as they both are, they’re still old-school, body-on-frame SUVs that don’t offer the same sophisticated experience as a similarly priced business sedans. They can handle the rough stuff better, sure, but for the most part, owners pay for capabilities they never explore. So how is it that no one thought of filling the void with a balance – 7-seater SUV presence and capability with luxury sedan opulence? The Kodiaq promises to be that balance and we’re driving it to see how it lives upto expectations. But let’s not explore the Kodiaq conventionally. Sense, simplicity and functionality. There’re a lot of boxes that the Kodiaq ticks. The doors, for example, get plastic protector strips that retract when the doors are shut, so you don’t ding your car or anyone else’s in a tight spot. Then there’s the full LED lighting, which blankets every exterior lighting system, including the reversing lights and cornering fog lamps. Should conditions get rainy like they did on our drive, there are umbrellas in the front doors which include drainage lines, and if you’ve got your hands full while loading up the boot, a simple swipe under the bumper is all it takes to get the tailgate open hands-free. It doesn’t stop there. The boot light doubles up as a torch, should you drop something at night, and a big quirk remains the seating versatility – a ballad of ratios. Keep the 50:50 split 3rd row seats up and you’ve got 270 litres of storage. Fold ‘em in, and it’s bumped up to 630 litres. If you need to move your refrigerator or beater hatchback, drop the 40:20:40 split 2nd row to free up 2005 litres! Ingress into the 3rd row is a bit tricky. The middle row folds down, but doesn’t tumble forward. Once in the back, you sit knees up too. Like in most 7-seaters, this is a spot for kids or adults over short journeys. The 2nd row is where a big difference vs its traditional rivals is apparent. The seats are high up but you don’t really need to climb in per se. If anything, it’s easier than the Superb since it doesn’t sit as low. Ease aside, there’s a true sense of luxury that comes as no surprise. The cabin feels airy, there’s leather on most points you’d touch and the seats offer great all round support with adequate foot room too. The India-spec gets the power nap package as standard, which includes a blanket+holder, manual sunblinds and the piece de resistance, lateral support extensions for the middle row headrests. They hold your head in place should you nod off. Ingenious! There’re no AC vents in the last row but the middle occupants get 1 out of 3 climate control zones, while the football field-sized panoramic sunroof ensures that this oh-so-desirable piece of glass isn’t just for the chauffeur. There aren’t any infotainment controls but you can get the Boss Connect app to control the media system, including the navigation. The literal centre of attention is the 8-inch touchscreen infotainment system. It’s one of the most fluid and lag-free setups we’ve ever used and comes with SmartLink i.e. Android Auto, Apple CarPlay and MirrorLink. It comes paired with a 10-speaker Canton sound system, which is very impressive but lacks the punch and surround sound experience the Superb's setup (12-speaker) offers. There is a party trick here though – voice enhancer. Given the car’s size, Skoda’s included a feature that lets you use the telephony mic to amplify things said in the first row using the speakers and relay them to the rear rows! As for the styling, you do have to rub your eyes for a second because there is some resemblance to the Endeavour’s dashboard. That’s largely down to the thick plastic panel that splits the dashboard into two. It’s also among the main elements that remind you you’re sitting in a different car, because the rest of the design isn’t a far cry from the Superb or Octavia’s. Other differentiators include the twin gloveboxes (with the lower one cooled) and the big, vertical AC vents that’ve been designed not just for better airflow but improved blower sound control. Both powered front seats offer immaculate comfort and support and get the memory function too. But bad news: Goodbye ventilated seats! The design is a blend of SUV and estate, and it’s somewhat similar inside. Sure, you do get the classic SUV drive stance that overlooks the bonnet, and visibility is great, so it’s actually easy to maneuver in tight spots. But you sit cocooned behind the dashboard, which does add a sedan-like touch. Refinement levels are decent but clatter is quite evident even at low revs. Vibrations are no issue at all but you will reach for the stereo or air-con to cover up the slightly industrial background score. Its ride is almost sedan-like, keyword being almost. In most conditions it rides flat, and while the underlying Euro-car firmness is evident over expansion joints, small potholes and rough patches, they’re heard more than they’re felt. At highway speeds it rides perfectly, with none of the vertical bobbing you’d get in a similar ladder-frame. Over uneven roads, though, there’s a lot of side-to-side movement. It settles quickly and doesn’t bounce but it’s a humble reminder that the Kodiaq is still a Herculean tall-boy SUV. Keep that in mind while driving it too because it certainly doesn’t excite. There’s ample low-end torque for city and expressway duties and it’ll do long distance cruises without a sweat. It’s a quick to rev engine too, but that seems kind of necessary. It’s essentially running the Superb’s engine in a meeker tune. Factor in the heavier 1799kg weight (over 230kg more than the Superb), weaker aerodynamics, 27PS/10Nm output deficit and the result is, ummm, an SUV. It’ll do low speed overtakes easily but the engine does sound strained doing so. On the highway, sticking to Sport mode is recommended. 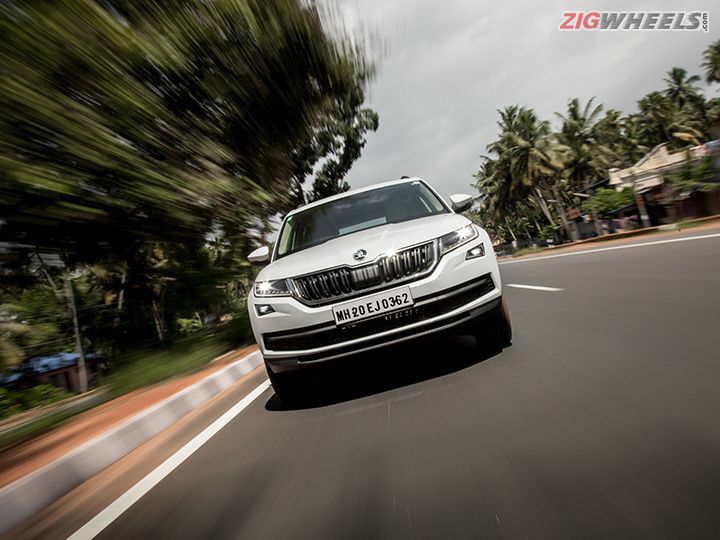 By no means does it turn the Kodiaq sporty, but it gives you the necessary responsiveness. There’s a Snow mode that’s unique to the Kodiaq since it gets all-wheel drive, which can be used in the muck/slush too. Just remember this is a premium SUV with some all-terrain capability, not the other way around. The Kodiaq does have the size appeal but in an understated and classier fashion than we’re used to. The Endy and Fortuner have the muscular and intimidating aura of a bouncer, while the Kodiaq looks like the chiseled lad you’d see in a premium garment advert. It does look like a slightly scaled down Audi Q7, which, of course, works for it. The family grille has been upsized as well but still looks proportionate thanks to the bulk behind. Its sharp body lines are a direct lift from the Superb, as is the concave effect you see on the lower half of the doors. Some traditional elements like the squarish wheel arches remain but at the same time, because of the sleek stance, it does look quite wagon-like from the side. In fact, were it not for the 188mm ground clearance and big 18-inch wheels, this could pass off as big estate. Yes, do it. Whether you want a premium alternative to old school 7-seaters or a more sensible alternative to big badge 5-seaters, the Kodiaq does for SUVs what the Superb did for business sedans. It feels luxurious; is loaded with features, including 9 airbags; and still puts practicality as a core pillar. The Kodiaq will only be offered in one fully loaded variant and we’re expecting a price of Rs 34-36 lakh. An aggressive price placement wasn’t what we expected but that’s exactly the word for the product packaging.